This week in weird Twitter food: Oreo rice? This rice prompted a fierce debate amongst the members of The Takeout staff. I’m essentially the cheese that stands alone, unsoaked in Oreos, in that I cannot imagine the Oreo rice being a particularly pleasurable experience. My cohorts Kate Bernot and Kevin Pang, on the other hand, were more open to the idea. They compared it to (potentially) rice pudding, cocoa rice, and “dessert risotto,” all of which make sense to me. Yes, there’s rice, milk, and sweets, that sounds like rice pudding. Yes, Oreos are chocolate cookies, and cocoa rice is good, ergo this should also be good. Yes, dessert risotto sounds cool as hell. So acknowledged. As it happens, this person didn’t invent “Oreo rice,” such as it is—or if he did, he’s not alone. Here’s the Tokyo-based SoraNews24, posting it as an original recipe experiment in 2012: “It’s a Far East spin on an American classic with a unique texture and fantastic taste that we guarantee your whole family will enjoy, even if it does look a bit like asphalt.” Emphasis mine. Here’s BuzzFeed, whose writers “had to try it” back in 2015. There’s a chirpy little video version, too. Here’s a single-serving version using rice cups and “Oreo mush,” both heated separately. It’s a lot of places. And it squicks me out in all of them. Maybe I’m just not an Oreo person? I don’t know. I can’t deal. But we are very curious to know if you can deal, so let us know below. 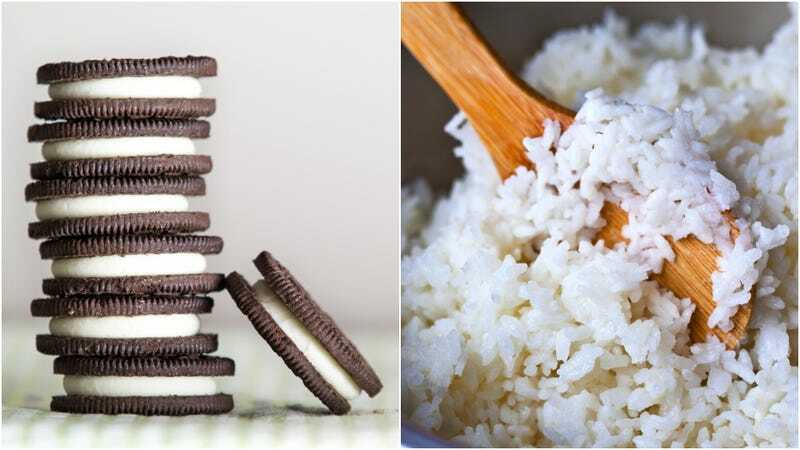 Oreo rice: yea or nay?